David Warner joined the Australian cricket team largely unheard of outside Sydney, but his remarkable international debut at the MCG on Sunday night could be the makings of a new star. Warner’s astonishing 89 from 43 balls, including six sixes and seven fours, easily upstaged his teammates and was the backbone of Australia’s 9-182 in the first Twenty20 match against South Africa. His towering hitting resembled that of a baseball slugger and was reminiscent of the extraordinary hitting of New Zealand’s Lance Cairns, who smashed six sixes at the famous ground during a one-dayer in 1983. David Warner, 22, is actually a throwback to the 19th century as that was the last time an Australian side featured a debutant who had never before played first-class cricket. John Hodges and Tom Kendall, who played in the very first Test match in 1877, are the other two players to have done so. Before this knock, Warner was arguably best known for wielding the revolutionary flat bat, which allows batsmen to use either side of the blade. On Sunday night he opted for a conventional blade but his performance defied everything. Warner’s half-century was the second-fastest in this form of the international game, the second-highest score by a debutant and among the handful of highest scores in this form. It also means he is now a shoo-in to play Sheffield Shield for NSW and could even be rushed into the Australian one-day side. “I wasn’t nervous, I felt very good right from the beginning … I loved every minute of it,” Warner told the Nine Network after his innings. 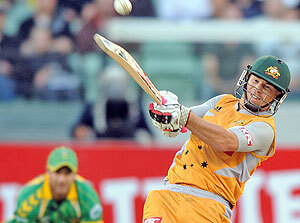 Naturally, Warner’s knock hogged the limelight during the Australian innings. How Australia’s David Warner reached his half-century from 19 deliveries against South Africa in Sunday night’s Twenty20 at the MCG. Fastest half-centuries in Twenty20 cricket internationals.